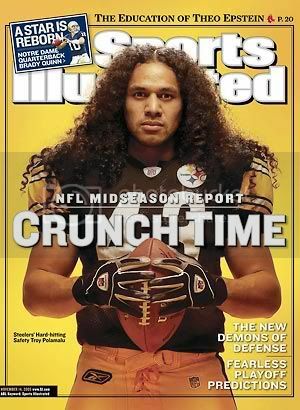 MBC: Troy Polamalu - Why Am I In This Handbasket? This pic isn't as good as the last one but a not so good picture of someone like him is still worth looking at and it is the Monday after the draft so I thought this would be appropriate. /sigh/ Yeah, the hair is what makes this picture worthwhile.